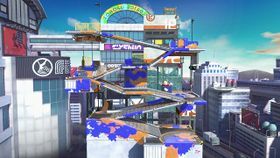 Moray Towers is a new stage in Super Smash Bros. Ultimate, set on top of a skyscraper with colored paint stains from Splatoon. The skyscraper has several slanted platforms the fighters can jump up and drop through. The sloped platforms meet at certain points, and if the player walks toward the slopes, they will take the lower ramp. Only by jumping can the player reach the above ramps. Moray Towers can also be played at night, when a Splatfest is taking place. Judd also appears with Li'l Judd in the background, and holds up the flag of the color of the fighter or team in the lead. "Splattack! ", the main theme of Splatoon, plays in Moray Towers, while the Squid Sisters' song "Ink Me Up" plays during Splatfests. Additionally, similar to Suzaku Castle, during the last 30 seconds of a timed match, the music changes to "Now or Never!" from the original Splatoon, which would play during the last minute of Turf Wars. This page was last edited on March 12, 2019, at 15:17.